This week Green Shropshire Xchange (GSX) today have supported the launch, for public consultation, of the draft strategy and action plan to deliver an electric vehicle charging network across Herefordshire, Shropshire and Telford & Wrekin. The initiative responds to the reality that existing electric vehicle charging points in the Marches area are both low in numbers and limited in geographical coverage. The strategy and action plan is intended to develop a cohesive,widespread, and reliable infrastructure. Voluntary effort has created the draft and will subsequently identify potential charging point hosts and begin the development process. It is often assumed that most electric vehicle users will charge up at home, but around 43% of existing car owners do not have access to off street parking. The proposed network should extend to locations where there is a high density of vehicles including workplaces, business and retail parks, public car parks (including Park & Ride), hotels and leisure facilities. The initiative is especially important to the local tourism sector to ensure visitors with electric vehicles have access to the facilities they need while visiting the Marches area. This initiative has the support of Shropshire Chamber of Commerce; Shropshire, Herefordshire & Worcestershire Federation of Small Businesses; Herefordshire and Worcestershire Chamber of Commerce, BESST (Business Environmental Support Scheme for Telford) and the Telford Business Board. The deadline for responses is 5.00pm, Monday 17 September 2018. 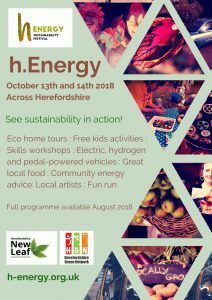 Electric Vehicles of ALL Shapes and Sizes Welcome at this year’s h.Energy – it’s likely there will be a showcase in both Hereford and Leominster – please be in touch if you’d like to be involved! events@hgnetwork.org. It will be very welcome to have electric vehicle charging points scattered about Herefordshire. However, the providers use a card payment system, which is unique to the provider, and not of any use to another providers ‘power point unit’ PPunit. Is any consideration being given to this aspect of payment, so that one can use any PP unit. Thank you, Roy, for commenting. Ideally all publicly accessible charging units would accept contactless payment allowing widespread use regardless of membership of a particular network scheme. The challenge we face is that the decisions on details lie with the host of the potential charging points. For example, a pub may wish to control use through tokens available at the bar and require a purchase of food / drink. The National Trust is expanding provision through its exclusive automotive partner BMW i. Other tourist attractions may have their own preference. The Council I believe operates charging points with POLAR requiring a membership or use of a (smart?) mobile phone. Supermarkets may have a national policy to follow and so on. This initiative is looking to local volunteers to help identify suitable potential locations, establish a relationship with the owner / business and offer some support to installation and commissioning. Each site will have its individual circumstances and host’s preferences together with potential costs and sourcing of funding, management of the installation process and possible involvement of national or regional operators who could take on the entire responsibility for the development. The initiative has no funding itself and relies on the hosts’ enthusiasm and potential willingness to invest, supplemented with any relevant government grant or partnership with existing operators. Other comments are most welcome as are offers of help.